↑ Nunavummiut, the plural demonym for residents of Nunavut, appears throughout the Government of Nunavut website ওয়েব্যাক মেশিনে আর্কাইভকৃত ১৮ জানুয়ারি ২০০৯ তারিখে, proceedings of the Nunavut legislature, and elsewhere. Nunavut Housing Corporation, Discussion Paper Released to Engage Nunavummiut on Development of Suicide Prevention Strategy. 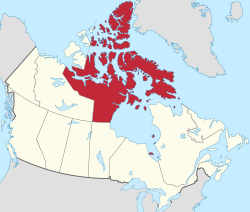 Alan Rayburn, previous head of the Canadian Permanent Committee of Geographical Names, opined that: "Nunavut is still too young to have acquired [a gentilé], although Nunavutan may be an obvious choice." In Naming Canada: stories about Canadian place names 2001. (2nd ed. ed.). Toronto: University of Toronto Press. (আইএসবিএন ০-৮০২০-৮২৯৩-৯); p. 50.